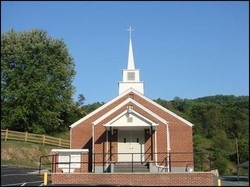 Buckeye Hollow Church is an independent Holiness Church. We believe in the Trinity, Father, Son(Jesus), and Holy Ghost. We believe in shouting, running, jumping, and speaking in tongues as the spirit gives utterance in our services. We are a Bible believing church that believes in both Holiness on the inside as well as the outside. We are very conservative in the way we dress and conduct our lives. At our church you will find freedom to worship God in the beauty of Holiness. We have spiritual gospel singing on a nightly basis. Our singers and musicians are not professionals, but the Lord blesses and anoints them. Our main focus in all things is to Glorify God and for the Lord to have his way. Our church has always had a reputation of being a spiritual and shouting church. Even though the world has commercialized it, there is still a difference between the fake and genuine. We still have the genuine Holy Ghost move in our services and we would like to welcome you to attend!